Bob Bradley will lead Egypt in a competitive game for the first time in Cairo when the Pharaohs host Ghana in the second leg of the World Cup playoff in what could be his final match in charge of the Pharaohs. The American coach said he was happy his team are back to their traditional venue before their enthusiastic supporter s, who have been banned from attending most of Egypt's games in their World Cup qualifying campaign due to lingering security concerns. In an usual long presser, Bradley seemed to be sending a farewell message as his spell draws to a close, with Egypt likely to miss out on a place at next year's World Cup finals in Brazil, having suffered a humiliating 6-1 defeat by Ghana in the first leg in Kumasi. "I am proud of the two years I spent in Egypt. I thank all Egyptians for their way of dealing with us in Egypt as I and my wife are always welcomed in the country," he said. "I also thanks the players for supporting me throughout the last two years I spent in Egypt," he added. Bradley, who took the charge of Egypt in November 2011, was burdened with the task of realizing the team's long-held dream of reaching the World Cup for the first time since 1990. The Pharaohs face Ghana on Tuesday at the army-owned Air Defence stadium, located in Cairo's Fifth Settlement. Egypt have a mountain to climb, as they need a five-goal margin victory against Ghana to make to the World Cup finals or at least secure an aggregate draw. "I could feel the players were not in the right frame of mind before the game. We made a couple of small mistakes at the beginning and the players became more nervous. That is my responsibility too but I told the players that they did their best," Bradley commented. "In the second leg we should play fast football so we must have 11 ready players as well as the substitutes." Bradley advised the Egyptian Football Association to keep tabs on the youth players and resume the domestic league without any suspensions if they are to reach the World Cup and end a lengthy drought. 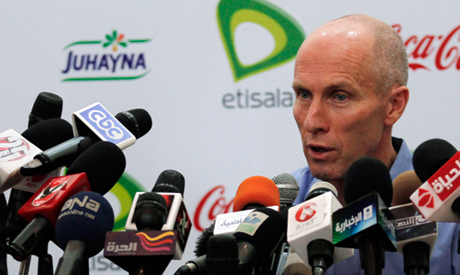 "Stopping the domestic league won't help Egypt to achieve any more," Bradley said. "To build something for the future you need vision and right people to go on. If you want good national team you should have players play in big teams. "So you should allow players to play in Europe, like Mohamed Salah who plays in Basel that participate in the European Champions league. That changes the players' mentality." Bradley also appeared to take a swipe at Egyptian media. "Media and sports critics and analysts they don't know really about football,!" he said. "Please understand me, I respect your job but there's no coach in the world who thinks media personnel know football more than him." The American went on to cite examples of what he believes was unjustified media criticism of his players "who gave their all. He said that he and his assistants have been working very closely with the players for two years and that they are the ones capable of really assessing their displays. Bradley hailed the impact and presence of Ahly and Egypt playmaker Mohamed Abou-Treika. Abou-Treika, who scored Egypt's only goal against Ghana, said he would hang up his boots at the end of the year. "I talked to him after the Port Said disaster [in February 2012] as he was thinking about retiring. And at that moment I could see how he is motivated and determined to reach the World Cup and push the players forward to realize this dream," Bradley said. "I coached a lot of great players throughout my career and I can say that Abou-Treika is among the best I had. "When you have a player like Abou-Treika in your team you have a good motivation to go on and achieve more." Bradley also said he hopes Ahly's African Champions League triumph can spur Egypt against Ghana. The Red Devils won a record-extending eighth title after beating South Africa's Orlando Pirates 2-0 in Cairo for a 3-1 aggregate win. "Dealing with teams is the most difficult thing you face as a coach when you coaching a national team," Bradley said. "In the previous two years I helped Ahly more than they helped me but I am proud of their achievements in the African Champions league. "I expected Ahly's victory despite Ghana's loss so it can help up in the coming game." Players owe it to the coach, to give there best shot. The players are experianced enougth to beat the very best on the field,and give it there best shot, with the right strategy, clear mind and vision on the field,who knows, they might pull it of. They owe the coach, there very best effort. There is no excuses, most of these players have played at top level and mixed it in with the very best, and have proved there quality to the footballing world. Players should ignore all the critism from the media and fans, and proof there worth on the 19th, many teams have made amazing comebacks, becouse they believe in themselfs ,and have faith in there teamates.Do not put to much preasure on themselfs and play with rationality and determination with extreme hunger for goals, do not get emotional and desporate. Cameroon beat tunisia 4-1 today, it is very possible, not impossible!.